This is the second post of a 3-4 part series on the Canterbury Earthquake. Was this Canterbury’s ‘Big One’? When I was shaken out of a deep slumber at 4:36 am last Saturday, I couldn’t help but think that ‘this is the big one’. The intensity of the shaking was certainly more than anything that I have experienced before. As I initially struggled to come to my senses, to even know if I was in the middle of a particularly vivid dream, it seemed that everything that wasn’t nailed down was jumping around. Over the next 20-30 seconds, the violent shaking and crashing escalated until it was nearly deafening. But not deafening enough to drown out the roar of the wave that was bearing down on us from the west at tremendous speed. A wave travelling through solid earth. When it arrived, the wave bore the entire house up upon its crest, and dropped us down the other side, as if we were afloat on some tempestuous solid sea. The 107 year old house flexed and groaned as the wave passed, protesting the immense strains that must have tested its solid wood-frame construction. The wave and its accompanying roar sped off towards central Christchurch, and the violent shaking and crashing resumed for a few more seconds. I don’t know exactly how long the main event lasted for, but at a guess, I would say that it was something like one minute. By then, as the shaking diminished, I knew that it wasn’t an Alpine Fault earthquake, which when it ruptures in the not-too-distant future, will generate strong shaking for several minutes. I will examine the likely impacts of the future Alpine Fault earthquake, and the implications of Canterbury’s earthquake for planning and preparing for the real ‘Big Event’ in another post in the near future. Saturday’s magnitude 7.1 earthquake was centered near Kirwee, approximately 44 km west of Christchurch, at a depth of only 10 km. So why didn’t we know that this potentially damaging fault existed beneath the Canterbury plains, quietly building up enormous energy, so close to Christchurch? The media has been portraying this as a ‘new fault’, which has not ruptured in the past. This is partly true in that this particular section of fault has not ruptured historically (i.e. within the last 200 years), and had not been previously identified. However, that does not necessarily mean that this fault hasn’t been active in the past. As noted by Dr. Mark Quigley, professor in Geological Sciences at Canterbury University, and one of the lead investigators on the ongoing assessment of the fault, it is possible that the recurrence interval on this fault is less than a few thousand years. Indeed, the modern day surface of the Canterbury plains is relatively young, having been steadily built out over the last 16,000 years, as the great braided rivers of Canterbury transport vast quantities of material from the Southern Alps. The Canterbury plains and the braided rivers that nourish them are, by nature, a very active landscape. So while this may indeed be a “new fault”, it is also very possible that it has ruptured in the past, but the surficial evidence of that rupture is no longer evident. While geophysical survey methods allow scientists to look into the earth, these techniques are time consuming, labour intensive, and require specialized, often expensive equipment. For these reasons, areas of interest (e.g. surface fault traces) are often identified prior to any major geophysical investigation. It would take a tremendous concerted effort and a great deal of resources to undertake a detailed geophysical investigation of a region the size of Canterbury. Consequently, it is very possible (perhaps even probable), that faults buried beneath the ephemeral surface of the Canterbury Plains may not have been discovered yet. 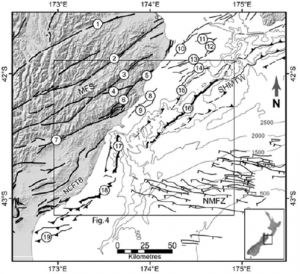 Faults Beneath The Canterbury Plains Predicted by Scientists? This is not to say that the presence of such faults hasn’t been predicted by scientists. 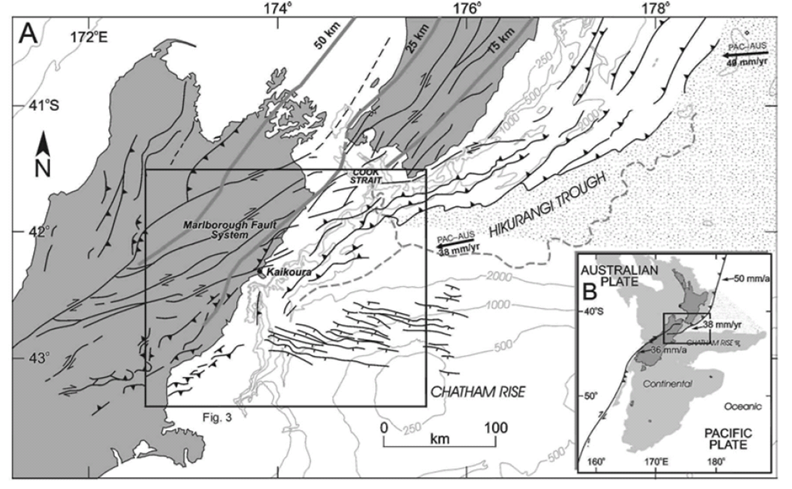 An offshore fault system has been identified in Pegasus Bay, and may be related to the relatively well-established Marlborough fault system. The Pegasus Bay faults trend NE-SW, and likely extend under the Canterbury plains. earthquake in Canterbury will provide the impetus to get this important task underway, so that Cantabrians have a better idea of what to expect next time. Excellent article and photos Jesse. Just a heads up that your link to Dr Mark Quigley’s website doesn’t work as it’s duplicated (needs to be reduced to http://www.drquigs.com). Don’t mean to be disrespectful but this piece is hilarious. So, it takes expensive equipment and expensive people to do a full geophysical survey and work-up of Canterbury. But, you have to concede, that rebuilding a City and treating the injured isn’t exactly cheap either. Betcha I could get the time of geologists a lot cheaper than, for example, an orthopaedic surgeon & theatre team rebuilding a crushed leg. People like that use very expensive equipment too…. Just a response to Miles – absolutely agree. But a key issue behind trying to understand how, and where, and the magnitude of impacts from another earthquake is so that we can understand the risk and try and reduce the vulnerability. Hopefully with that done, we wont need to use the orthopaedic surgeon etc etc. Thanks for your comments Miles. It certainly wasn’t my intention to write a “hilarious” post! Rather, the main point that I had hoped to get across was that while the science community does have the technology and know-how to properly survey the siesmic geology of the Canterbury Plains, the political will and economic resources to do this are not necessarily available. Your point about the “cost” of the disaster is well taken, but I would remind everyone that all the scientific investigation in the world isn’t going to prevent such disasters from happening in the future. Hazardous natural processes will continue to work as they always have. At best, we will be better prepared for the next one. what do u think caused the earthquake ? Any truth to the rumour Christchurch CBD will be relocated? Alan, I would be very surprised if there were any truth to that, but then again, I’m not a city planner. I imagine that it would be more practical to improve the building standards in the CBD, than to try to relocate the whole works. Very interesting, as was your all-too-short radio interview. I agree that all the exploration of this fault will not stop another such event occurring (which is hard for us to adjust to), but it can only make us more aware, and hopefully prepared to withstand the effects. We will never find anywhere on our planet that is entirely safe, and in NZ? Well I always thought Wellington was the earthquake prone city, Auckland maybe to volcanic action, and other centres would all have some potential hazard. We live on a moving planet and are only now becoming aware of it. Keep up the good work and keep us informed. Thanks. I gather that the whole of New Zealand has an earthquake risk with the City of Wellington supposedly at very high risk as it is supposed to located on a major fault line. Surrounding countries and Islands are supposedly also at risk from Tsumanis possibly generated by these quakes. The Christchurch Cathedral should be rebuilt as it is part of Christchurch’s hertiage. It could be strenghtened against future earthtquakes. What is your opinion on artificial earthquakes? Do you believe it is possible? Can magnetic waves, directed into the earths ionosphere and reflected back to earth, have an effect on a fault line ready to slip? im not saying it was created, but there are alot of speculations leading to this theory, such as the beaching of 107 pilot whales a few days before the earthquake. Maybe the magnetic waves could be heard by them, and thats what lead them to be stranded. Nowadays, there are such technologies that are being used for military purposes, scientific research, weather manipulation. But is it possible? Information and discussion about the Alpine Fault seems to have been dropped in the light of the 2010 and 2011 events. 1) The impacts of the event of 22 February in Canterbury have been all-consuming for many of us. While I very much want to utilize the heightened awareness resulting from the Canterbury events, to increase our collective awareness of Alpine Fault hazards, I am also wary that people just want to get back to “normal”, without earthquakes ruling every moment of our lives. However, things do seem to be quieting down, and the Chch rebuild will (hopefully) start in earnest soon, so I think that it will be a good time to discuss the Alpine Fault in the near future. 2) I’m writing up my PhD thesis at the moment, and there just isn’t much spare time! Your point is a good one, I’ll get onto it soon (probably early in the new year). Just one more quick thing, to clarify “strong shaking for several minutes”.